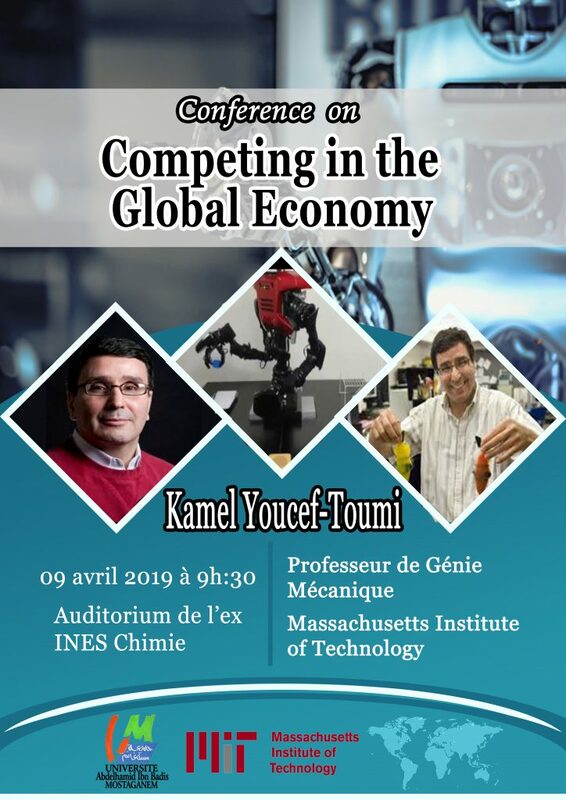 Professeur Kamal YOUCEF –TOUMI, chercheur sur les systèmes de commande et robotique au Massachusetts Institute, of Technology (USA), sera l’invité de l’université de l’université Abdelhamid Ibn Badis, Mostaganem pour le 8 et 9 Avril 2019. Il présentera une conférence sur le ‘Compteting in the Global Economy’, le 9 Avril à 9h30 à l’auditorium de l’Ines de Chimie. Une invitation est ouverte à l’ensemble des enseignants, chercheurs, doctorants et étudiants de l’Université Abdelhamid Ibn Badis, Mostaganem pour assister à cette conférence. Background: Kamal Youcef-Toumi joined the MIT Mechanical Engineering Department faculty in 1985. He earned hisadvanced degrees (M.S. 1981 and Sc.D. 1985) in Mechanical Engineering from MIT. His undergraduate degree(B.S. in Mechanical Engineering awarded in 1979) is from the University of Cincinnati. Professor Youcef-Toumi’s research has focused primarily on design, modeling, simulation, instrumentation, and control theory.The applications of his work have included manufacturing, robotics, automation, metrology and nano/biotechnology. Heteaches courses in the fields of automatic control systems; robotics; precision machine design and mechatronics. He played an important role in the MIT international research and education collaborations, includingQatar, Russia, Saudi Arabia, Singapore, and the United Arab Emirates. Professor Youcef-Toumi was selected as a National Science Foundation Presidential Young Investigator « inrecognition of research and teaching accomplishments and academic potential »;awarded by President Ronald Reagan. He served as a member onseveral professional committees of The National Science Foundation, Chairman of the InformationTechnology program within The Arab Science and Technology Foundation, Member of the review committeefor European Union funded Network of Excellence for Innovative Production Machines and Systems, Memberof the Scientific Committee for Qatar Foundation Annual Research Forum, Head of the Controls,Instrumentation and Robotics Area in the Mechanical Engineering Department at MIT, Member of the MITCouncil for International Programs, and Research and Strategy Advisor for Qatar Computing ResearchInstitute, Co-Director of the Center for Clean Water and Clean Energy at MIT and KFUPM.He is the Co-Director of the Center of Complex Engineering Systems at KACST & MIT, Director of the MIT Ibn Khaldun Fellowship Program, and Director of the MIT Mechatronics Research Laboratory. Professor Youcef-Toumi has served as a consultant for several companies including AT&T Bell Laboratories,EDO Corporation, Varian Radiation Division, Gillette Corporation, Delta Search Laboratories, Jentek Sensors, MorganStanley Co., General Electric, TEKES – National Technology Agency of Finland, Jordan Hospital,MitsubishiElectric Corporation, Penn State University-College of Medicine – Cancer Institute, Board of Trustees at the University of Sharjah, and Saudi Aramco. He is a member of IEEE and an ASME Fellow.He served as Chairman of the ASME Dynamics Systems & Control Division Robotics Panel. He was anAssociate Editor of the ASME Journal of Dynamic Systems Measurement and Controls, the InternationalProgram Committee Chairman for the 2010 IFAC Symposium on Mechatronic Systems, and an Associateeditor of the ASME’s Dynamic Systems and Control Division (DSCD) Conference Editorial Board. He hasserved as Editor of several symposia/conference proceedings. Professor Youcef-Toumi is the author of over 320refereed publications, including a textbook on the theory and practice of direct-drive robots. He holds about 50 registered/pending patents.Professor Youcef-Toumi has been an invited lecturer at over 200 seminars at companies, research centers and universitiesthroughout the world.